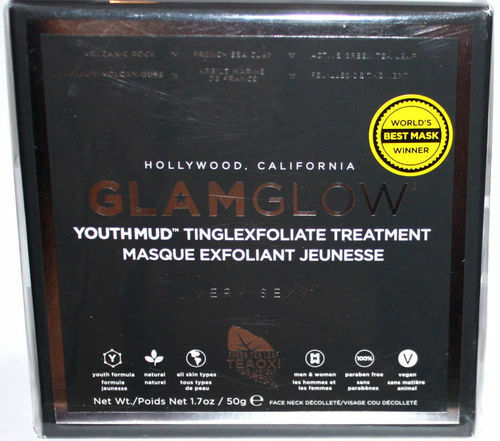 GLAMGLOW Youthmud Tinglexfoliate Mask Treatment, 1.7 oz *Reduced*. GLAMGLOW Youthmud Tinglexfoliate Mask Treatment, 1.7 oz. Designed for Hollywood’s entertainment, music, fashion and award industries for camera ready soft glowing skin. A 10 minute professional quality mud mask for men and women. Dredged off the coast of southern France, home to glamorous Cannes, St. Tropez and Monaco. Glamglow is an amazing rapid gentle exfoliant mud mask for men and women, high in ancient volcanic pumice rock, super antioxidants and minerals. Glamglow activates moisturizing 'collagen synthesis', revitalizing complexion for illuminating, brighter radiant skin. Penetrates and softens wrinkles and fine lines leaving the skin smooth, supple, glamorous and glowing. Glamglow helps correct discoloration and improve skin's texture. Directions: Apply a medium layer to clean skin. This formula will tingle, tighten and lighten in 15 minutes or less. Rinse off with water in circular motions to exfoliate. Use once or twice a week or as often as desired. Ingredients: Purified Water, Montmorillonite, Kaolin, Magnesium Aluminum Silicate, Polyethylene, Pumice, Camellia Sinensis Leaf, Camellia Oleifera Leaf Extract, Vitis Vinifera Extract, Chamomilla Recutita Flower Extract, Calendula Officinalis Flower Extract, Cucumis Sativus Fruit Extract, Hedera Helix Plant Extract, Symphytum Officinale Leaf Extract, Lavandula Hybrida Oil, Vegetable Glycerin, Aroma, Phenoxyethanol, Methylparaben, Butylparaben, Ethylparaben, Propylparaben, Isobutylparaben, Diazolidinyl Urea.